We’ve been away on holidays and it has been so difficult getting back into a routine of cooking and housework. All I want to do is laze around in post-holiday bliss. Not having the motivation to cook doesn’t mean we don’t have the motivation to eat. Unfortunately for us, post-holiday also means it is time to curb the spending, so going out for dinner last night wasn’t an option. 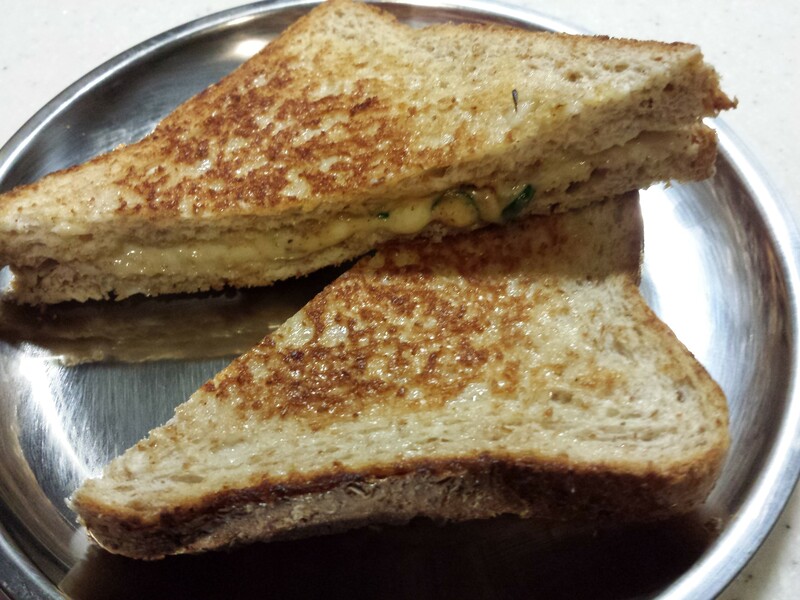 I made some grilled cheese sandwiches and they were a hit with very little effort required! This is the deluxe version and it was fantastic. We’ve had them for three consecutive meals since and we’re still not sick of them! Spread mayonnaise evenly on the outsides of the sandwich bread. On the inside, distribute cheese, chilli, onions and coriander evenly. Press the slices of bread together. Heat a pan on a low heat and place sandwich mayonnaise side down. Cook until bread is golden and crisp. Flip the sandwich over and press gently with a spatula. The cheese will melt. When the second side is also golden and crisp, remove, slice in half and enjoy!